Presbyopia is an age-related condition when the eye’s lens doesn’t change shape as easily as it once did, making it more difficult to read or see things at close range. Presbyopia affects all patients later in life, irrespective of other refractive errors such as nearsightedness and farsightedness. When you are young, the lens in your eye is soft and flexible. The lens of the eye changes its shape easily, allowing you to focus on objects both close and far away. This action of the eye is called Accommodation. After the age of 40, the lens becomes more rigid. Because the lens can’t change shape as easily as it once did, it is more difficult to read at close range. This is why people over age 40 often find themselves holding reading material farther away to be able to see it clearly. Reading glasses are a very common and easy way to correct presbyopia symptoms and are typically worn just during close work such as reading, sewing, and other close activities. These “readers” are easily purchased over the counter at drug stores and bookstores, or custom made reading glasses may be prescribed by your doctor. If a person also has myopia (nearsightedness), hyperopia (farsightedness) or astigmatism, the conditions will combine. If you wear contact lenses, your eye doctor can prescribe reading glasses that can be worn with your regular contacts to help you adjust to detailed, close-up work. 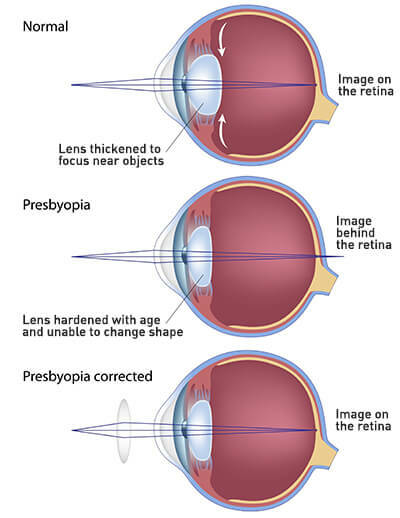 Eyeglasses with bifocal or progressive lenses are another common method of correcting presbyopia. Bifocal lenses have two different points of focus. The upper part of the eyeglass lens is set for distance vision, while the lower portion of the lens has a prescription set for seeing close work. Progressive lenses are similar to bifocal lenses, but they offer a more gradual visual transition between the two prescriptions, with no visible line between them. Another option for correcting presbyopic vision is multifocal contact lenses. Just as bifocal lenses have two levels of corrective power, multifocal contact lenses create multiple levels of corrective power.